There’s something about the month of September that no matter how warm and sunny it is, you still know that summer is over. But who said you have to behave like summer is over? Which is why September happens to be one of my favorite months of the year, especially for picnics. Certainly, picnics are queen in the height of summer, but sneaking a few in during early fall when the weather permits feels extra good. Actually it feels like you’re cheating a bit, which means the payoff feels a little mischievous. Like sneaking an additional cookie or two out of the cookie jar when someone isn’t looking. The other thing that September has going for it is the ample amounts of produce. It’s as if you can tell that summer worked really hard at producing food, and now you get to reap the benefits before the cold weather sets in and we’re all back to root vegetables. My favorite food-loving ladies Emily, Jessie, Kristen and I have a semi-regular standing lunch date, and just because the summer season is technically over and school is back in session doesn’t mean that we have to play by the rules. So we picnicked, and I pulled together a few seasonal goods to make this grilled eggplant salad. 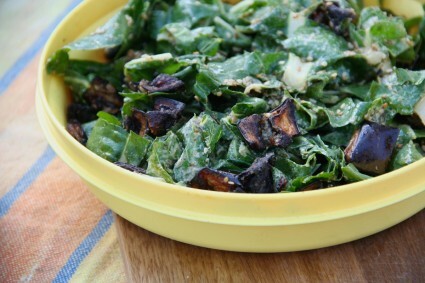 While raw chard isn’t usually a thing that most people would go for, with the eggplant and the tahini sauce I think you will be pleasantly surprised. I roasted the eggplant with a bit of chili powder for an additional kick, but feel free to leave out if you’re not into spicy food. So on the next sunny September day, make this salad, find a friend or two, get in a picnic – even if it’s a short one – and embrace this wonderful month. Cut the eggplant into about 1-inch sized cubes, and place into a bowl. Add the garlic, olive oil and chili powder and mix together until the eggplant cubes are evenly coated with oil and chili. Spread the eggplant cubes out on a baking sheet and bake at 400°F (200°C) for about 30 to 40 minutes, until the eggplant is soft and a deep golden brown. Remove the eggplant from the oven and let cool while you prepare the dressing. Combine the tahini, olive oil and lemon juice in a bowl and whisk together until smooth. You can also put in a glass jar in a lid and shake it until it’s smooth. Finely chop the mint leaves and add to the dressing. 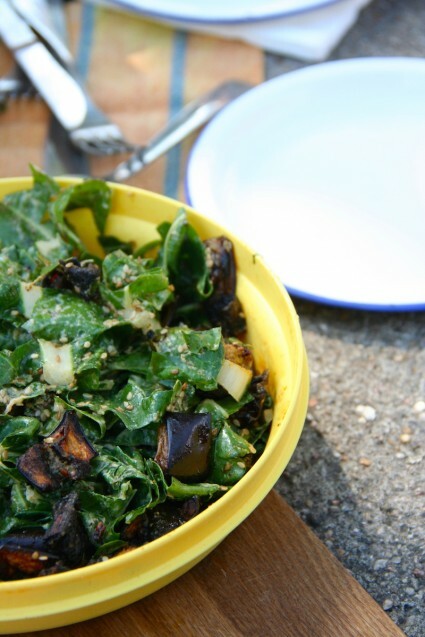 Chop or shred the chard and combine in a salad bowl with the eggplant. Top with the dressing and sprinkle with sesame seeds. Toss until the chard and eggplant are evenly covered in dressing.